Chef David Shalleck, a 1983 graduate of the College of Visual and Performing Arts’ Department of Drama, will hold a cooking demonstration and book signing on Friday, Oct. 4, at 3 p.m. as part of Syracuse University’s Orange Central celebration. The event, which is free and open to the public, will be held in Room 304 of the Hildegarde and J. Myer Schine Student Center. Shalleck, who lives in San Francisco, has worked for more than two decades as a fine dining chef and television culinary producer alongside some of America’s most celebrated chefs and hosts. He has cooked in noted restaurants and for special events in New York, San Francisco, Napa Valley, London, Provence and throughout many of Italy’s famous regions. 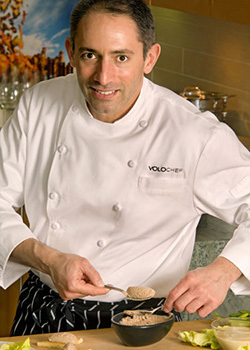 He has created Mediterranean menus for Windstar Cruises and is also the founder of VOLOCHEF™, offering private dining and specialized services to the food service and media industries. Shalleck’s recipe, menu, food styling and food product development clients include production companies, publishers, restaurant operators and many national brands. Parking for the event is available in SU pay lots. For more information, contact Traci Washburn, VPA director of alumni affairs, at 315-443-4728 or tmwashbu@syr.edu. SU alumni may register for Orange Central at orangecentral.syr.edu.